Sunderland head coach Gus Poyet says Stoke's Steven N'Zonzi should have been sent off for his clash with Jack Rodwell in Tuesday's League Cup defeat. French midfielder N'Zonzi appeared to grab Rodwell by the throat, annoyed by the Englishman's challenge, after which referee Mike Dean booked both players. The score was 1-1 at the time, with the Potters going on to win 2-1. "For grabbing someone by the neck, by the rules it's a red (card)," Poyet told BBC Newcastle. "We're disappointed. Sometimes you can make a mistake, but you can't make a mistake in that situation. "You see it, you cannot say you didn't, the fourth official saw it and those are the rules by the book." 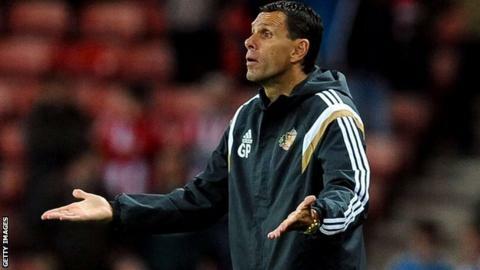 Despite the frustrations, Uruguayan Poyet said he will not consult the official to discuss the decision. "I don't like them to give me explanations that are not the reality," added Poyet, whose side were beaten by Manchester City in last season's Capital One Cup final.